Contrary to the opinions of my uncle, who recently explained to me that "these protests don't accomplish anything," the wave of actions that have electrified the nation since the current president's first day in office have fostered unity among his dissenters, given voice to minority communities, and visibly pissed off the man supposedly in charge. 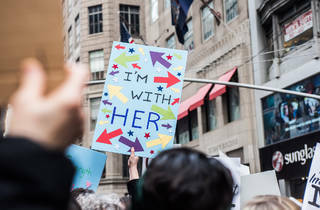 Next Wednesday, in honor of International Women's Day, the organizers of the Women's March have called for a A Day Without Women, a national strike meant to illuminate the pecuniary power of women and gender non-conforming people, even in spite of income inequality, harassment, and especially in a world order defined by a "businessman president." Participants are asked to take three steps on the big day: take off work; avoid shopping (unless patronizing businesses owned by women or minorities); and wear red. Protests and individual actions will be taking place all day Wednesday, including a Women's March-sanctioned rally and march starting at Washington Square Park at 4pm. Follow the Women's March Facebook or Twitter accounts to learn about other NYC-based actions. *The author listened to Shania Twain's Greatest Hits while writing this post. For a lot of us, it will be a wear red day. I hate Trump, but if you all take off work, I hope my temp agency rings me right up. You obviously can afford a day without pay. More for me.